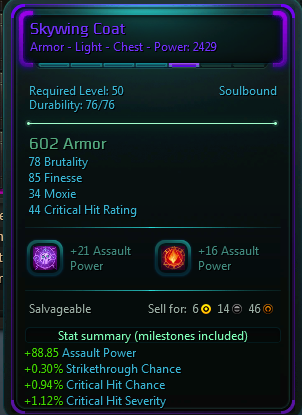 NEW GEAR ALERT NEW GEAR ALERT, this gear only cost a SIgn of Fusion Major also so fairly cheap to mass roll for better stats. New advice chill out with the complete nuking of stats just for more Finesse try to take up the Finesse to the highest without killing any other stats then adjust. I’m part of the World First Ohmna guild(video coming soon), Enigma, and been pretty active with helping out the Wildstar Community. 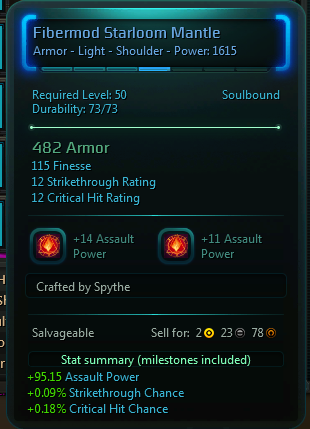 A lot of this crafted gear are the items we’re using in GA and will be for Datascape(the 40 man). So here is my version of a BiS guide for people that have platinum and a bit worried about not being geared enough for Veteran Dungeons. Here is a better formatted version which includes a rune guide, crafting guide, and now a BiS with crafting and adventure gear. 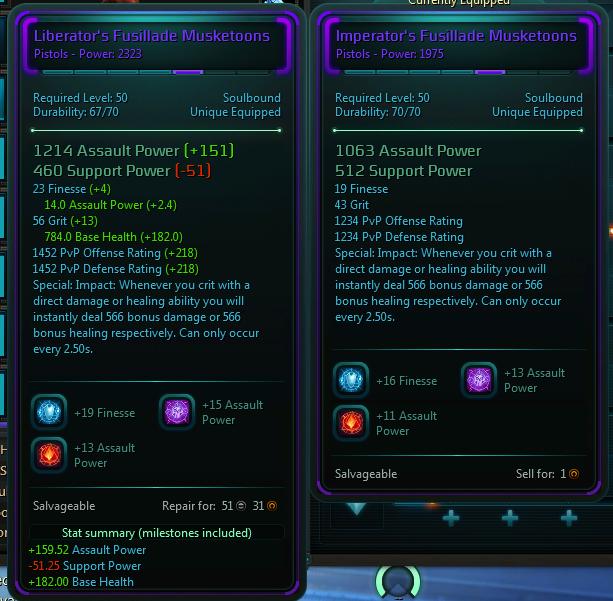 There is a few more epic world drops you can buy but aren’t exactly ideal for a spellslinger. 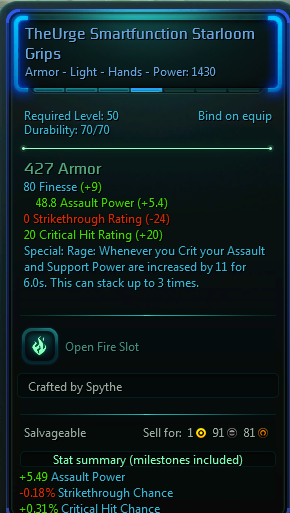 Crafted gear, yes crafted gear. Is currently amazing and a good way to get really solid gear without stepping foot in a veteran dungeon. I have a crafting guide above this to explain the basic but there I will show the pieces and what you should aim for when it comes to sockets and specials. With how crafting works, this is pretty much the exact same for each armor type. The few exemptions are heavy classes that are rocking Light Armor for the special Rage since Tailor seem to be the only class that can get the max rank of the special Rage. Heavy Armor classes want to focus more on Assault Power than their main stat because it doesn’t scale well like Light and Medium classes. For helm you want to get Epochos and go for the Special Concentration, which is pretty much a +22 Finesse during combat. 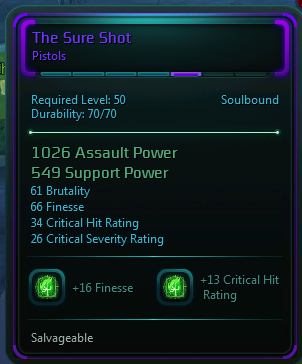 Not the great runes but their good since Air(Focused Surge – Finesse) and Water(Spellweaver – Finesse) can both be Finesse while Logic can be ST for Weapon Specialist. Ideally you want at least 1 to 2 Fire or Fusion slots where you can put AP in. Then Water/Air for Finesse and Life for Finesse as well but Life is the least valued. 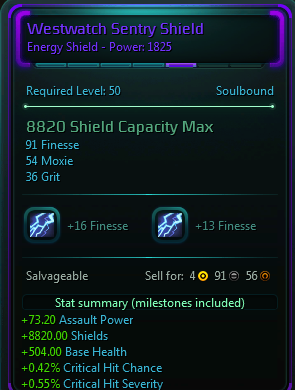 If you have platinum you can do the Epochos Combat Mantle for more stats with a Dual Hybrid Core but the price point to worry about on these are the Sign of Fusion – Eldan(requires 2 to make) that are going for 19g on Avatus. This is an example of the Rune slots you want to get, here is 2 Fire Rune slots. 1 is AP weapon specialist and the other is AP Assassin. 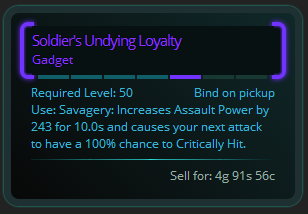 With these gloves you want the Special Rage which gives you 33 AP with close to 100% uptime during a fight. If you want more stats you can go with the Epochos Combat Hand Wraps but just like the Shoulders the price point is how much Dual Hybird Core cost and Sign of Fusion – Eldan. With all crafted gear you want to re roll til you get the elemental rune sockets you want. These gloves are solid but if you want to use this as raiding gear I would aim for at least 2 rune slots with 1 being Fire or Fusion. Fire is more valued than Fusion since it can lead to more set bonuses. Chest is fairly easy to explain you want to avoid Epochos because the chest special takes away too much power and doesn’t provide any actually DPS benefit. 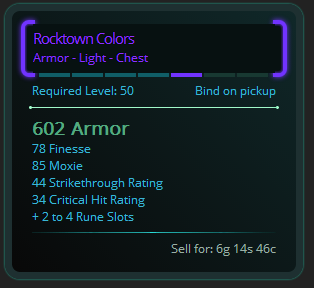 So stick with the 50 one and same rune set up applies. Try for at least 1 to 2 Fire/Fusion slots, then Water/Air/Life/Logic(least valued). The bottom chest rolled Fire > Fusion > Air > Life. For legs you want to stay with the 49 one because the Epochos legs have a special and the price point for the amount of times you may have to re roll. 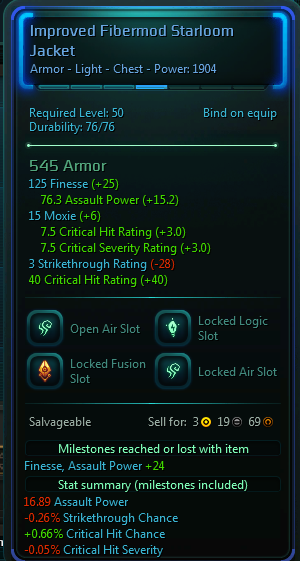 These legs have Moxie as the main stat but you can change that to any stat you want, for a SS you clearly want Finesse. These legs are pretty much the close to the best you can roll for any class. Fire > Fusion > Fire. The only thing that can be better is an additional rune slot of any kind. For the boots this choice is also clear, you want some boots special so stick with the 47 ones and go for Dasher or Calisthenics. The movement or dash regeneration/movement speed are must have for Dungeons and Raids. Way more over valued than have a few more DPS stats, avoiding red telegraphs = staying avoid and avoiding damage = more DPS. The quicker you get out of red circles the quicker you can get back to DPS and doing your rotation. And you can also craft Epocosh ones, if you want to go the crafting route make sure you go with the special Impact, without that special Sure Shots are better. 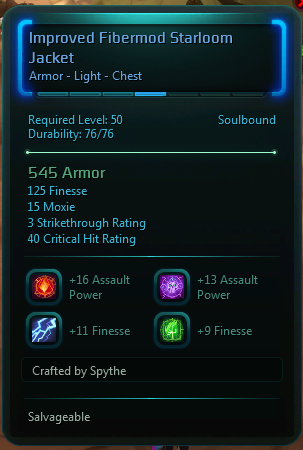 Since we’re on Crimelords this is a VERY VERY VERY good chest, it has the main stats you want ST and Crit Chance. 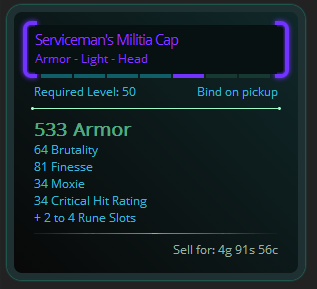 Its low on Finesse but those secondary stats are really good, crafted gear is almost as good but don’t undervalue the secondary stats on items. 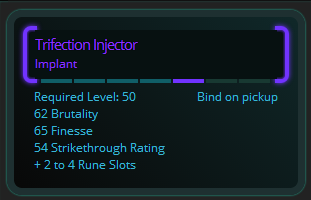 This is a really really really good implant since it has Brut AND StrikeT rating on it which is perfect if you have a lot of crafted pieces on your character. I did A LOT of WoTW and only seen this drop 3 times so it may be extremely rare but worth farming just to help out with ST.